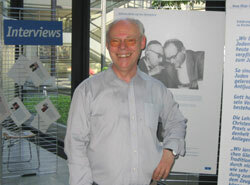 – By Rev Volker Stolle, Mannheim, Germany. It would not have been in concordance with the polity of the LCA “sister” church in Germany, the Independent Evangelical-Lutheran Church in Germany (SELK). This sermon must have been written between 2001 and 2005. Before retirement, he was a lecturer at the SELK seminary in Oberursel (North of Frankfurt/M) and previously the director of the SELK Mission Blekmar. In Germany, he probably would be the person best informed about the history of the Old Lutherans in Prussia (the roots of the LCA and the Missouri Synod Lutherans) and (some of) the current affairs. In our church, each initiative comes with the [traditionally Biblical] motto, “And whatsoever ye do, in word or in deed, do all in the name of the Lord Jesus”. However, in this case it is difficult to begin liturgically. We can not yet agree how to understand the Word of God. Therefore, this has to be an un-delivered, purely fictional sermon, which may however hopefully soon become reality, and thus it also is an angry sermon. He has given gifts to the people. As the Son of God became human and not only [a male] Man, and as God loves humankind in totality and not only a part of it, so Christ has spread widely his gifts of grace. He did not leave out any, woman or man, who are related to Him in faith and who call Him their Lord. He has given gifts as such to all humans. And this is surely just beautiful. Today, Hans and Grete [two fictional candidates for Ordination] are standing in front of us. In their [final] exams they have given outstanding proof that Christ has also endowed them with their gifts. And now we place them in the Ministry of the Church. And while inducting them onto their office we know that Christ too is installing them. They will help in preparing the Saints. Christ is tirelessly committed to caring for us, and he utilizes the ministry of ordinary people like you and me, whom, however, he has endowed with his gifts. In this way his work progresses unstoppably in this world. However, there have been times in which the Church did not dare to use all the Christ’s gifts. The church has for a long time [and] of deference to the general conditions in our society ordained only men into its ministries, and it saw itself supported by the words of the Apostle Paul. It would have been considered objectionable if women as well had come forward in the public sphere of the church. The intention was to protect the church from malicious suspicions. And yet it maintained the use of the inclusive language [of the Bible] and held fast to the Word of the Scripture according to which aptitude for the ministry [of the Church] rests with [all] the people. Not only in our Bible text but also in his Second Letter to Timothy, Paul instructed his pupil with the rigour of the New Testament: “And the things that thou hast heard of me among many witnesses, the same commit thou to faithful men, who shall be able to teach others also.” (2 Timothy 2:2, KJV). Without any gender-related restriction, the word is about “a person”. That was anything but self-understood. For the Roman-Catholic Church the Office of the Church derived decidedly from the Old Testament understanding of sacrificial priesthood. This perception supported the teaching of the sacrifice of the mass. By condemning the sacrifice of the mass, the Reformers discerned that the Office of the Church derived from Christ and the Apostles and not to mean borrowing the idea of the Priesthood as practised at the temple of Jerusalem. With this recognition, the stipulation of granting this office only to men also became obsolete. Though the Reformation identified thus recognition in its teaching, it did not transmit it into congregational practice: One may hold back in the in the matter of churchly practice if this serves the [cause of] peace in the church. Accordingly, it is the humans [i.e. the people, Menschen] that are the subject of the ecclesiastical office. Gerhard elucidated this principle in detail in a special chapter. God does not, in his love of humankind, ordain angels for this purpose [of ministry], but just people despite all their weaknesses. But of course, Gerhard considered women’s weaknesses to be such an impediment as to disqualify them for this office. Yet he emphasised that this limitation was not a matter of principle but valid only in view of specific circumstances — i.e. in the public sphere and under normal conditions, thus making it in fact a general rule. Today, we are happy no longer to have to take into account such considerations as were deemed necessary in the past. It has taken a long time for societal conditions to align themselves with the pointers of the Gospel. Clearly and without ambiguity the Apostle Paul had already stated that in the Christina community inter-human limitations resulting from natural, social or religious differences were abolished: “There is neither Jew nor Greek, there is neither bond nor free, there is neither male nor female: for ye are all one in Christ Jesus.” (Galations 3:28, see also 1 Corinthians 12,13). However, it was still not easy to bring together Jewish and Gentile Christians and to build up an atmosphere of general tolerance. It [also] took a long time to abolish slavery and serfdom. And now is at last the equality of man und women too is slowly being established. This societal developments accords well with the Gospel. We rejoice that people are willing to contribute their gifts endowed to them by Christ towards the preparation of the Saints. We are grateful that this has become possible without any restrictions. For our times desperately need people who commit themselves, with all the gifts granted to them, to spread the Word of God, to lead [people] to Baptism, to administer Communion, to express God’s Salvation to individual persons, and to direct the building up of the church. As the Word of God has already become precious in our lands (cf 1 Samuel 3,1), valiant commitment is required to not leave our fellow humans without the comfort of God. Surely, the Lord Christ, who grants the gifts to people, is the same who has previously ascended to the heavens and has taken the prisoners with him — that is the Lord unto whom “all power has been given in heaven and in earth” (Matthew 28,18 KJV), and he who has since long taken control of those powers that pretend to be great in the world. He governs this world, and He wants to build his kingdom with all peoples. Christ’s gifts granted to the people serve this great goal. However, we may not want to limit their deployment overanxiously, but rather foster them as much as possible and therefore also allow ourselves to be engaged. Therefore we rejoice today to commission you, Hans and Grete, for the Service of the Gospel and to be able in God’s name to send you into the work of His Kingdom. May the Lord, who has given people gifts, bless your the deployment of theses gifts; and [may he] bring many more gifted people to stand alongside you. SELK = Selbständig Evangelisch-Lutherische Kirche in Deutschland (Independant Evangelical Lutheran Church in Germany),is a confessional Lutheran church body of Germany. It is a member of the European Lutheran Conference and a member of the International Lutheran Council (ILC) (of which the Lutheran Church – Missouri Synod of North America is also a member). The SELK synod has about 36,000 members in 200 congregations. The seat of SELK is in Hanover. Further information: , English; , German. . The author is playing with the German word „ungehalten“, which may refer to the delivery of a sermon („Predigt halten“) or the English equivalent of angry, indignantly, or displeased. Born at Nellingen near Ulm, Bavaria, Germany (January 19, 1563 – October 23, 1616), Hutter was a German Lutheran theologian. Why can this sermon not be delivered in an SELK church? a) this sermon is un-Biblical? b) that we first should listen to the [SELK] Constitution (Paragraph 7,2)? c) that we can only part from old traditions with difficulty? d) that we quite to establish a counter society? e) that we quite consciously intend establishing a counter society? * “Hans and Grete“ are the proverbial pair of [typically German] names, which Martin Luther too uses in his “Marriage Booklet” , and that is part of the Lutheran Book of Concord (cf the diminutive forms in the fairytale “Hansel and Gretel”). Incidentally, Luther’s parents were called Hans and Grete. * Philipp Melanchthon: Loci praecipui theologici von 1559. Definitiones: “Minister Evangelii est persona ordinata a Deo mediate vel immediate ad docendum Evangelium et ad Sacramentorum administrationem et ad puniendum verbo, non vi corporali” (StA 2, 796,3-6). This definition represents a personalised translation of Article 5 of the Augsburg Confession, which defines the “Office of the Ministry”. * Leonhard Hutter: Compendium Locorum Theologicorum, First Edition, Wittenberg 1610: “11. Quid igitur est Minister Ecclesiae? Est persona, autoritate divina, per Ecclesiam legitime vocata, ad pure docendum verbum Dei, et administrandum Sacramenta, iuxta institutionem Christ” (re-edited and re-published by Wolfgang Trillhaas, Berlin 1961, 79,33-36). * On 15 June 1563, the Roman Catholic Church determined during its 23. Session of the Council of Trent: “According to God’s ordinance, Sacrifice and Priesthood are interrelated in such a way that both exist in each Testament. As the Catholic Church has visibly received the holy sacrifice of the Eucharist according to the institution of the Lord, one has also to confess that in her a new, visible and external priesthood exists into which the old [priesthood] has been transferred [integrated ? ].” (Denzinger/Hünermann: Kompendium der Glaubensbekenntnisse und kirchlichen Lehrentscheidungen, 37. Auflage, Freiburg i. B. 1991, 568 [Nr. 1764]). The statement “Inter insigniores” on the admission of women to priesthood, issued by the Congregation of the Faith on 15 October 1976, justifies the exclusion of women solely on the basis of the Mystery of Christ and the Mystery of the Church (Denzinger/Hünermann, 1385-1392 [4590-4606]). Significantly, it skips the fundamental reference to the Old Testament concept of priesthood. * Johann Gerhard: Loci Theologici (1610-1622), Locus 23, Caput 10: „Ministerium ecclesiasticum [est] officium sacrum et publicum divinitus institutum ac certis hominibus per legitimam vocationem commendatum, ut peculiari potestate instructi verbum Dei doceant, sacramenta administrent ac disciplinam ecclesiasticam conservent ad hominum conversionem et salutem promovendam, Dei vero gloriam propagandam“ (Edition Ed. Preuss Vol. 6, Berlin 1868, 265). * In defining the Ordination in terms of entrusting “the office of the church to a person who is qualified and has been called by the Church” (“per quam ministerium ecclesiasticum personae idoneae ad illud ab ecclesia vocatae commendatur”; Caput 3, Sectio 12; ibid 97), he [Gerhard] however picks up the term person again. 1. It is against the Natural Order and the Law. 2. It is against decency and humility. 3. A male has a better decision-making ability and power of judgement. 4. A woman is able to lead her husband to sin (Eve and Adam). 5. The female propensity to idle talk has to be restricted. 3. a regulation for the normal case and for the emergency case. 3. inter ordinariam regulam et casum necessitatis extraordinarium”; ibid., 126). In Orthodox Dogmatics, the positioning of a statement has always to be regarded in the hierarchical system of the line of thought. The superior positioning of the above statement that the “material” in which the office [of the ministry] can be found is the people, determines all further statements and relativises them in view of the main statement. It is therefore not of the essence of the Office [of the church] that it be administered by a male. * The 9th General Convent of the Pastors of the SELK in 2001 restricted itself by not allowing further applications on the topic of the Women’s Ordination for their next conference in 2005. However, they did not mean to adjourn discussing this topic but rather create space for an intensive study of the following question: “Even though it appears to demand too much patience of many in our church, further intensive efforts are required to reach an agreement on the evaluation of the Biblical findings […] The theological task is being carried out with the objective of preparing a clarification of the matter of Ordination of Women in our church” (appendix 9 to the APK 2001 minutes in Oberursel). The invitation to discuss this sermon also serves this purpose. or “Little John and Little Margaret”, a well-known fairy tale of German origin, recorded by the Brothers Grimm and published in 1812. The synodical structure of the LCA undermined. One could be forgiven for surmising that it was Pastor Semmler who decided the direction of our Church. Recently we surmised that Pastor Semmler may have been suffering hubris syndrome. He continues to impose on the Church his idea of what the process of consensus should look like, regardless of the wealth of information arising in the last few decades on that topic. He continues to place faith exclusively in his proposed committee of 5 ‘young’ men. Rather than seeing himself as the Chairperson of General Synod, who facilitates the will of that collective, he appears to have taken a strategic political approach in order to stymie the progression of women’s ordination within the LCA. Yet, Pastor Semmler declares that there will be no decision at the next Synod, in March 2013. Such assertions are in direct contravention of the LCA synodical structure . How will he justify that decision if there are motions to Synod proposing women’s ordination? Surely, given the Synodical nature of our Church, there would be no option but for delegates to discuss such motions. 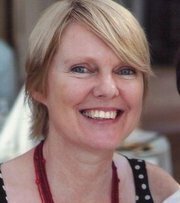 The trouble is that nothing will change until congregational leadership arises across Australia and New Zealand to protest the way that women continue to be excluded from pastoral leadership in the LCA. Perhaps it’s time that men stood up to support their sisters, wives and daughters. Heaven knows we need their insight and wisdom. What might you do to assist women in the LCA? How might your voice be heard this week? How might you encourage your congregation to provide leadership? Who can you sit with to dream about bringing change? So often we think we have got to make a difference and be a big dog. Let us try to be little fleas biting. Enough fleas biting strategically can make a big dog very uncomfortable. Social Change can only happen when we not only realize that we need to change, for ourselves and those we love, but become willing to take action. 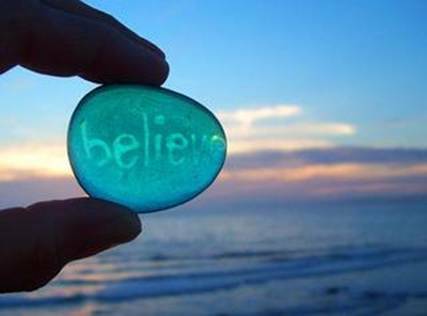 Belief in our ability will follow. One of Margaret Mowczko’s most read posts. In the current discussions about the roles of women in the Church, Phoebe, Junia and Priscilla have received a great deal of attention. These three women are mentioned in the New Testament as being involved in significant Christian ministry. Much of the discussion surrounding these women concerns identifying their actual ministries, and evaluating the precedent, if any, they set for women in the Church today. (read more) Euodia and Syntyche: Women Church leaders at Philippi. This photo of an elderly CFW Walther is an addendum to an earlier post. We find it useful to put a face to a name. In this case, an unforgetable one. This is apparently one of four extant photos of him. 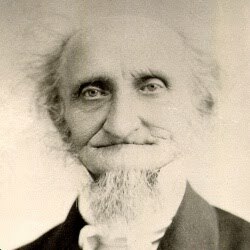 CFW Walther (1811-1887), the first president of LCMS argued in support of slavery. His behaviour and ethics will wait for another post. 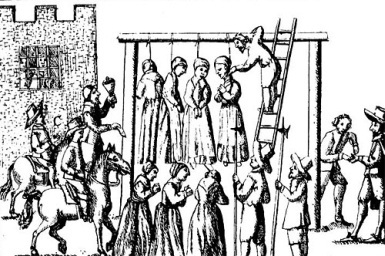 The devout Christian and philosopher, John Glanville, who was one of the Royal Society’s founders (mid 1640’s), argued that witches were real and did so as a defence against atheism. He and others, like Robert Boyle (of Boyle’s Law) believed that if you could prove empirically that there were undeniable supernatural phenomena in the world it would disarm atheistic arguments. It’s interesting how demonising women is still used as a tool to substantiate a position. Whether it’s proving the magical power of witches, proving the subordination of women in general or specifically those who are called to ministry, the intent is similar – to control other people in the social and spiritual realms. Late Night Live 14th Feb 2011. Professor Michael Hunter, in discussion with Philip Adams, on the ambiguous role of the Royal Society in discrediting belief in witchcraft, alchemy, astrology and other forms of magical thinking. 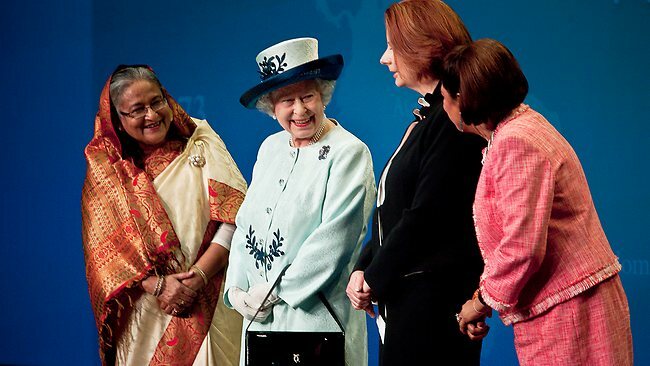 This photo from CHOGM is another significant demonstration of women’s leadership today. Check an earlier post on the Qld floods. Apart from significant women’s leadership, the Queen’s message to delegates was pertinent. Here’s how the Herald Sun reported it. Opening the Commonwealth Heads of Government Meeting in Perth, the Queen surprised many delegates by directly reminding them they represented people and not just governments, and calling for “positive and enduring” results. It could have been directed at leadership and delegates at General Synod in the LCA.